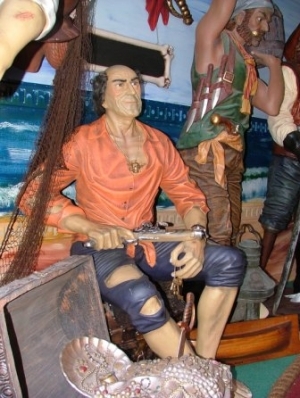 This fantastically detailed life-size 3D model of a Pirate sitting on a replica Treasure Chest can be placed indoors or outdoors to add to a pirate theme or promote any nautical related business. 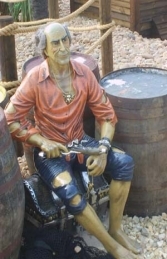 This super Pirate comes attatched to the Treasure Chest he is seated on. 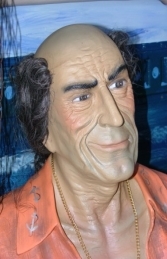 He has real hair and is so life-like that everyone stops to check! 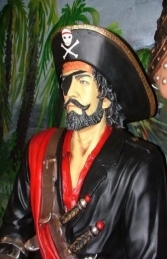 This fantastic life-size figure is ideal for Treasure Island Pirate themed areas, advertising or drawing attention to your business.